Jazz music has evolved since its inception in the late 1800’s and early 1900’s, creating a jazz family tree of styles. Jazz by nature is an evolving and exploratory form of music and new shoots continue to sprout. At the very root of this tree is Ragtime. Ragtime itself was an amalgamation of many forms of music such as traditional African songs and folk music mixed with traditional European musical forms such as waltzes and marches. These styles were however only really influences upon Ragtime and why it is consider the first form of jazz. Ragtime was born in the South of the United States and so was jazz’s first variation. New Orleans Jazz (sometimes referred to as Dixieland), developed from the popularity of ragtime. Musicians in New Orleans embraced this new style but used the instruments from brass bands which were popular in the city at the time. This change of lineup brought about changes in the music with the skill and influences of the musicians, creating the New Orleans style. This style was less focused on the solo, but there was more individuality shown from the players. Musicians would embellishing their playing to show off their talents. In New Orleans Jazz improvisation had become a huge part of the style. In the 1920’s Jazz’s popularity began to spread across the United States with new musicians exposed to the genre. One of the major Cities to be captivated by this modern style was Chicago. Chicago in the 1920’s was a city going through drastic growth and changes with the youth of the city rebelling against the traditional societal values. A more individualistic and outspoken society was being created. This is reflected in Chicago Jazz which is characterized by its focus on innovation and improvisation. Back in New Orleans Hot Jazz becoming more prominent led by a musician named Louis Armstrong. Hot Jazz featured collective improvisation where the band would work around a central melodic structure to produce new and original work. The size of a hot jazz band was beginning to grow too from the basic brass band. This in most part was due to improvements in recording technology which allowed more instruments to be recorded at one time. In the 1930’s Jazz not only began to become the prominent form of popular music in the United States but also spread across the Atlantic to Europe. It is also a decade considered to be a golden time in Jazz history with the emergence of the Kansas City scene. 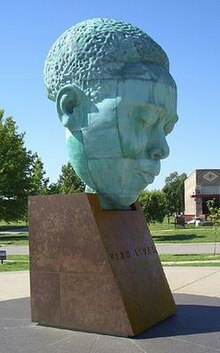 Kansas City Jazz is regarded as the beginning of what is regarded as modern jazz (see our article on Kansas City: The birthplace of modern jazz ). Kansas City Jazz fused blues styles with jazz and the heavy amount of improvisation created ground breaking and innovative music. During the 1930’s Swing was king. Swing was based on New Orleans style Jazz but using large orchestras and was full of the new innovative influences from Kansas City . The music was fun and invigorating making it great to dance to, giving it that mass appeal. Swing would continue to be a dominant form of music well in to the 40’s & 50’s. Jazz had been exported to Europe during and post World War I by American soldiers posted on the continent and had become a popular form of music. New European inspired variations of jazz also began to appear the most notable being Gypsy Jazz (see our article Gypsy Jazz: A European variation of an American invention). Gypsy jazz or Manouche jazz’s (as it is also known) main exponent was a Belgian by the name of Jean ‘Django’ Reinhardt. In this style string instruments are used opposed to the brass and woodwind instruments used in American forms. There is also no rhythm section, with the beat being played out by banging on the stocks of their instruments. Jazz’s influence across the globe would continue to spread, leading to further innovation and styles. There are many cities associated with Jazz, yet few have had as much of an influence upon the genre as Kansas City. Not only is it the birthplace of Jazz legends, a city where Jazz evolved, and a place where jazz matured. The history of Jazz in Kansas dates back to the 1920’s but the scene really boomed in the early 1930’s. Kansas had become a crossroad city, with the transcontinental airliners stopping in the city to refuel and a hub of the railroad network being based in city. This led to great growth and drew people from all across the United States, bringing their music, culture and experiences to the city. At the time of this great growth a man named Tom Pendergast was helping fuel the city’s notoriety. Pendergast was the ‘City Manager’ who controlled the city council and due to the immense political power he held ‘ruled’ the city. His influence extended across all city institutions including the police force. This led the force as whole to turn a blind eye to alcohol and gambling during prohibition. This disregard to prohibition and the all night party scene it created attracted many musicians from across the country. Musicians from the previous Jazz centres of New Orleans and Chicago were attracted by the relaxed nature of the city and the burgeoning musical scene. The mixing of musicians made a hotpot of creativity leading to the creation of the city’s own style, ‘Kansas City Jazz‘. Kansas City Jazz differed from the more traditional forms of the genre that had been played in New Orleans and Chicago previously, creating what was regarded to be a more modern sound. One of the main differences between the styles came in its bar structure. Kansas City Jazz had a heavy blues influence which led it to be played with a 12 bar structure (blues style) as opposed to the traditional jazz 8 bar structure. It also became famous for improvisation and use of solos. Due to the length of the sets at clubs, (in many cases 8-12 hours) songs could go on for hours with a band improvising with frequent and elaborate riffing. The skills and techniques the musicians were acquiring began to really shape the music in the city. This new and innovative form of jazz began to dominate the national scene influencing many musicians from across the country. Kansas City Jazz can also be credited with being the catalyst for the transition from the dominance of big band, by creating swing and then the improvisational style of Bebop. Kansas City’s ties to jazz are strengthen as the birth place and home to many key figures in jazz history. The city’s most famous son is probably Charlie ‘Bird’ Parker. 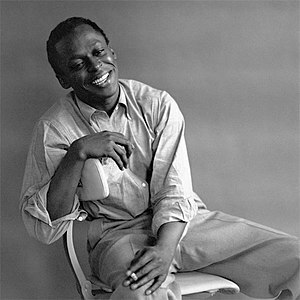 Born in August 1920, Parker grew up in a time when Kansas reigned supreme in the world of jazz. Although being too young to be an active participant in the early Kansas scene, Parker was undoubtedly influenced by the music and creativity in the city in his formative years. After his untimely death in New York in 1955 at the age of just 34 Parker’s body was returned to Kansas City where he was laid to rest in Lincoln Cemetery. Another jazz legend Count Basie spent many years in the city and was one of the major innovators in this new form of music. Basie played regularly with his band at the Reno Club in the 18th district which was home to the city’s jazz scene. Kansas City today still has many links to its Jazz history. The 18th and Vine District is synonymous with jazz in the city and is home to the American Jazz Museum. The museum houses numerous items from jazz history and has exhibits focusing on key figures in jazz. It also operates the Blue Room and Gem Theatre which hold live performances of jazz. The whole area is also filled with establishments playing and dedicated to jazz and blues music. The jazz era in Kansas City was effectively ended in 1940 when Tom Pendergast was arrested and subsequently jailed for tax evasion. The political vacuum left was filled by more conservative figures leading to a crackdown on liquor laws and on the jazz clubs of the city. This led to many musicians to leave the city. Kansas City would never recapture this vibrant and creative scene, but in that brief 15 year period the world of jazz and music had been changed forever. Jazz had a heavy blues influence which led it to be played with a 12 bar structure (blues style) as opposed to the traditional jazz 8 bar structure. It also became famous for improvisation and use of solos. Due to the length of the sets at clubs, (in many cases 8-12 hours) songs could go on for hours with a band improvising with frequent and elaborate riffing. The skills and techniques the musicians were acquiring began to really shape the music in the city. This new and innovative form of jazz began to dominate the national scene influencing many musicians from across the country. Kansas City Jazz can also be credited with being the catalyst for the transition from the dominance of big band, by creating swing and then the improvisational style of Bebop. The Saxophone: A young innovative instrument for a young and innovative form of music. The saxophone has become one of the core instruments used in jazz composition since the style inception in the early 1900’s, but many people may not realize that the Saxophone only predates jazz by just over 60 years. The Saxophone was invented by Adolphe Sax in the mid 1800’s. Adolfo was born in the small picturesque town of Dinnant, Belgium where his father worked as a musical instrument maker. Adolphe developed his fathers passion of inventing new instruments, this led him to try and perfect a bass clarinet which evolved into the first saxophone. Over many years the design of the saxophone was modified and perfected with the assistance of composer and friend Hector Berlioz. 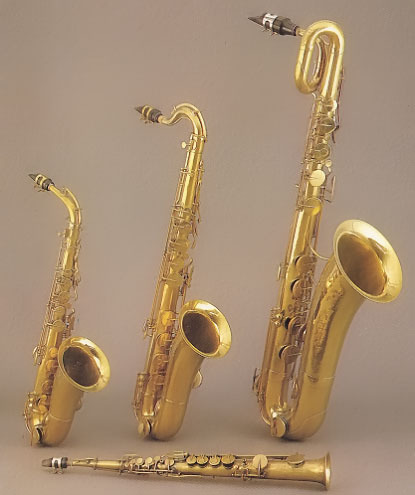 The saxophone was exhibited at the Paris Industrial Exhibition, this coincided with the performance of the fist choral works to include the saxophone composed by Berloiz. The saxophone was later that year included in orchestral performances in Paris. The instrument was also adopted and became popular with marching bands due to its sound, design and durability. In 1846 Adolphe obtained a patent for the saxophone with its 14 variations and the following year a school was set up in Paris to teach the instrument. It was not until 1885 that the first saxophone began to be made in North America where they became popular with military and marching bands. Many early jazz groups used the instruments from marching bands, this accessibility to the instrument lead it to become an integral part of early Jazz bands. Today the saxophone is the instrument most synonymously linked with jazz with both feeding off the others success and development. You are currently browsing the archives for the Jazz History category.